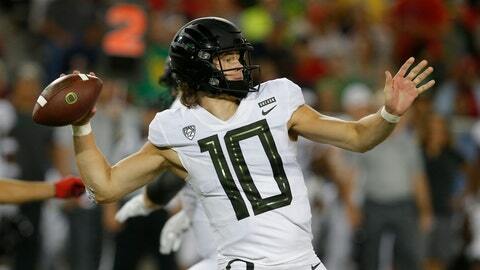 As a soon-to-be senior, Oregon quarterback Justin Herbert knows this about spring football: It’s a process and it’s rarely smooth. Some thought Herbert might skip his final year with the Ducks but he announced his intention to return before the team’s 7-6 victory over Michigan State in the Redbox Bowl to cap last season. Oregon finished 9-4 and Herbert threw for 3,515 yards with 29 touchdowns and just eight interceptions. He has 63 career TD passes, ranking him fifth among active quarterbacks heading into the 2019 season. Herbert will be joined this year by his younger brother Patrick, a tight end who was among 10 early enrollees taking part in spring practice. Other newcomers this season include defensive end Kayvon Thibodeaux, a five-star recruit from Westlake Village, California, and Penn State graduate transfer Juwan Johnson, a 6-foot-4 wide receiver who will help fill the void left by the departure of Dillon Mitchell. Two days after the bowl game, Mitchell announced that he would leave Oregon early for the NFL draft, set for later this month. Johnson, who had 81 catches for 1,123 yards and two touchdowns over three seasons at Penn State, just joined the Ducks a week ago. At the team’s recent spring practice road-trip to Hillsboro, Oregon, just west of Portland, Johnson caught a touchdown pass from Tyler Shough, who is expected to be Herbert’s backup this season. Shough also threw an interception to Thibodeaux. Shough has appeared in three games for the Ducks. Herbert’s backup from last season, Braxton Burmeister, left Oregon for Virginia Tech in February. In addition to Thibodeaux, Oregon’s defense is breaking in new defensive coordinator Andy Avalos, who has been at Boise State for the past seven seasons. Avalos took over for Jim Leavitt after he parted ways with Oregon in February. Outside linebackers Jalen Jelks and Justin Hollins have graduated and are eligible for the NFL draft. But like Herbert, inside linebacker Troy Dye announced in January that he would return for his final year. Head coach Mario Cristobal, embarking on his second season with the Ducks, has been impressed so far with the first-team defense. Overall, the team is still working out the kinks, treating spring workouts much like fall camp. Herbert was encouraged by the team’s progress. The Ducks’ annual spring game is on April 20 at Autzen Stadium. Oregon opens the season on Aug. 31 against Auburn in Arlington, Texas.